Head coach of Rayon Sports of Rwanda Djuma Masudi says the play-off tie in the CAF Confederation Cup between his team and Nigeria's River United is far from over. In the first leg in Port Harcourt on Sunday, Rivers United won 2-0 thanks to goals from Emeka Atuloma and Cote d'Ivoire's Guy Kuemian. 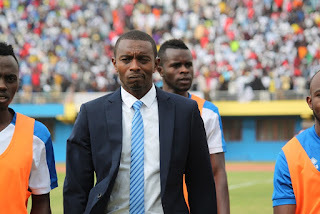 Despite the first leg deficit, Masudi is upbeat about his team's chances of progressing into the group stage. "When you play matches, you expect a win, draw or loss and I accept that we have lost this game," Masudi told cafonline.com. "However, this is just the first ninety minutes of the entire encounter as the remaining time will be played in Kigali. "I have seen the strength and weakness of our opponent and we are going back to prepare well for the return leg with the ticket for the group stage in our minds.